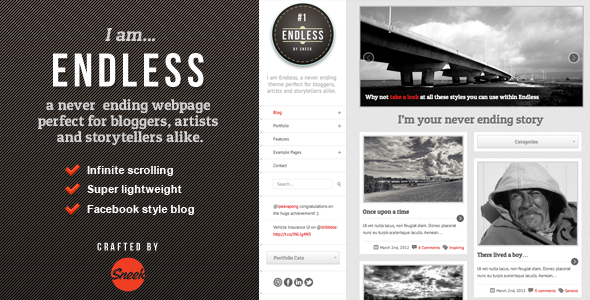 Endless is "never-ending" webpage for those of you who have gone to a website and thought to yourself, "Gee, I wish this website never ended so I could keep reading it, not only for the rest of the day, but also for perpetuity." It's basically an ajax lazy-loader that loads posts when you get to the bottom of the page. It does in fact end when you run out of posts. This is a great theme for someone with a blog who thinks the rest of the world cares, even in the slightest degree imaginable, what he has to say. It would also be a good theme for those rare, precious sorts of people – people without which I have no doubt our entire civilization would crumble beneath its own weight – who go on partisan political rants in order to educate your ignorant mind with their pristine enlightenment.